Last night I added a new edible plant family to my life list – Cornaceae – courtesy of the ever-hospitable Marcin Zych and his home-made fruit liqueurs. The one he opened after dinner was made from the fruit of edible dogwood (Cornus mas) and had been maturing for five years. It was sour but delicious, and very, very strong. That’s my first new addition to the list since my Brazil trip back in in November 2013. One day I will post an annotated list of the biodiversity of plant families I’ve consumed….but not tonight, it’s the end of a tiring final day of the SCAPE conference. To end the meeting this morning there was a short session of three talks from Klaus Lunau’s sensory ecology group. Klaus started the proceedings with a talk about the role of UV-absorbent dark central “bull’s eyes” in the middle of flowers and compound inflorescences. He concluded that, despite their near mythological status, UV patterns were perhaps no more important than patterns absorbing at other wavelengths and presented some interesting experimental data to support the argument. Over breakfast Klaus and I had discussed the absence of difficult questions at the conference; he felt people were being a little too polite. So I asked him a hard one – whether his findings held up for male bees which don’t collect pollen. He confessed that he’d not tested them and agreed that it would be worth doing: hope he does, will be an interesting test. Klaus was followed by Saskia Wilmsen who showed us the results of some elegant experiments using artificial “flowers” with different shaped epidermal cells (flat, conical, etc.) These different surfaces have distinctive optical properties in different light conditions, and bees behave in slightly different ways, accordingly. A very cool reminder that as we move to ever finer scales in pollination ecology, from macro biogeographical and community questions, to micro surveys, the layers of complexity just go on increasing. This latter point was reinforced by the final presentation of the meeting, which was Sebastien Kothe discussing the functional role of the spines possessed by pollen in some plant families, especially Malvaceae. He presented compelling evidence that these spines have evolved in order to reduce their attractiveness to pollen collecting bees. The spines render the pollen hydrophobic meaning that the bees have to use much more nectar to bind it into the pollen baskets. It would be interesting to track the evolution of this echinaceous pollen through the fossil record and to assess whether its appearance coincides with the evolution of particular bee groups. And with that, the 29th SCAPE meeting was finished except for the usual hugs and goodbyes and promises to meet up again in 12 months time, probably inside the Arctic Circle: it looks as though the 30th meeting will be held at the field station at Abisko. The rest of Sunday was spent visiting the botanic garden and the art museum in Aarhus, both to be recommended if you have a chance to visit. It’s now 8.15pm and I’m sat at Billund Airport with a large glass of Carlsberg, my first of the trip. It’s been a great meeting and I look forward to repeating it next year, and interacting with such a passionate group of scientists. Over and out from SCAPE. We’re in Denmark, so I had to use the old Carlsberg meme. And anyway I stole it from Jane Stout who used it on Twitter this morning. So there. The day kicked off with two talks on pollen limitation in plants by Amey Iler and James Rodger. Both challenged some preconceived ideas about the nature of pollen limitation: Amy that it was independent of flowering phenology and James that biodiversity hot spots were more likely to be pollen limited. Amy found that pollen limitation is more likely to occur early in the flowering time of some plant populations, but not all. James showed that the South African flora was significantly less pollen limited than expected. Marcos Mendez also challenged us to re-think whether or not reproduction by plants has a cost on other aspects of plant growth and survival: his meta-analysis suggests not and I hope he writes up the work soon. But, as Marcos mentioned, he has a lot of on-going reviews to complete…. Beate Strandberg discussed the subtle effects that herbicides can have on non-target plants in non-target habitats, via drift from agricultural fields. Specifically they can reduce the number of flowers and delay flowering time in plants that are important pollen and nectar sources for pollinators. Expect to hear lots more about this in the future: it’s not just the neonicotinoid pesticides that are worrying researchers. Finally Soren Nedergaard has spent a winter on Tenerife in the high altitude lava deserts of Las Canadas, one of my favourite places to do field work, and discovered that some of the plants and bees are active for 12 months of the year! I’m still trying to digest that finding, I don’t know of any other ecological communities that have the same plants and pollinators interacting all year, every year. Is it unprecedented? Does anyone know of other examples? Even in the tropics plants tend to have a rest period when they don’t flower. That’s it, just a quick flavour of day 2 as it’s almost 6pm and time for a beer, though not a Carlsberg: they only serve more exclusive beers here…. In an interview with the BBC the Governor of Alaska has claimed that further oil exploration in his state is required in order to pay for the damage being caused by current climate change. What next for common sense and logic? Convicted burglars claiming that they have to rob more houses in order to pay court fines? 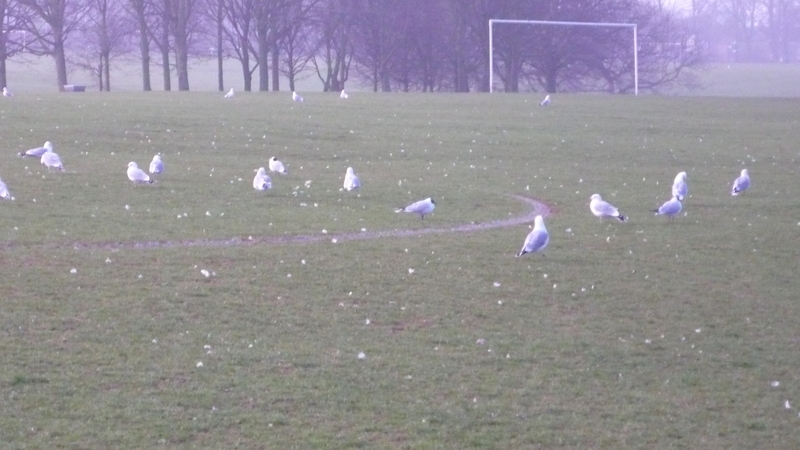 For the second in my occasional series of “data I’ll never publish” I want to present a short post about how two species of gulls use an urban Northampton park in the winter. The park is called the Racecourse (I’ve mentioned it before) and is en route to the campus on which I work. It’s long been apparent that the numbers of gulls using the park increases from autumn into winter and declines to zero in the spring and summer, when they head off to breed in and around Northamptonshire’s reservoirs and gravel pits, and further afield. During the winter they spend their time feeding on earthworms, squabbling, chasing crows, and generally relaxing prior to the next breeding season. 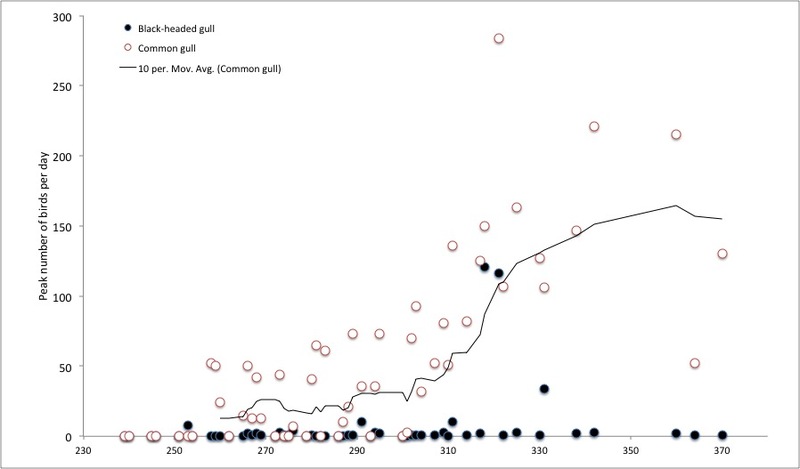 What I was interested in knowing was just how quickly the numbers built up, whether it was a slow, steady build-up or a rapid influx of birds, and also the relative numbers of the two commonest species to be found there, Black-headed gull (Chroicocephalus ridibundus) and Common gull (Larus canus). A few things intrigue me about this. First of all, Common gulls are much more, er, “common”, on the park than Black-headed gulls, despite the fact that Black-headed gulls are far more abundant in the UK during the winter (estimated as 2.2 million versus 710,000 birds). However anecdotally I’ve observed that other parks in Northampton appear to have more Black-headed gulls, suggesting that the two species are to some extent dividing up the urban parks and other grasslands between themselves, like rival gangs with different local patches. That’s purely speculative and would be worth pursuing as a student project, to test if (a) this hypothesis is correct; and (b) whether that division of the parks is stable between years. The other thing that’s of interest from these data is that, as you can see from the 10-day moving average, the Common gulls suddenly increase in numbers around the middle of November. I wonder whether this is due to an influx of migrant birds coming in from further north and east in Europe and Scandinavia? At the same time I recorded an unusually large flock of Black-headed gulls: were these also migrants just passing through? Urban gulls have been getting some bad press recently; but they really are fascinating birds that add a lot to the biodiversity interest of our parks and playing fields. They deserve further study because we take them for granted and there’s really not much published on their urban ecology. 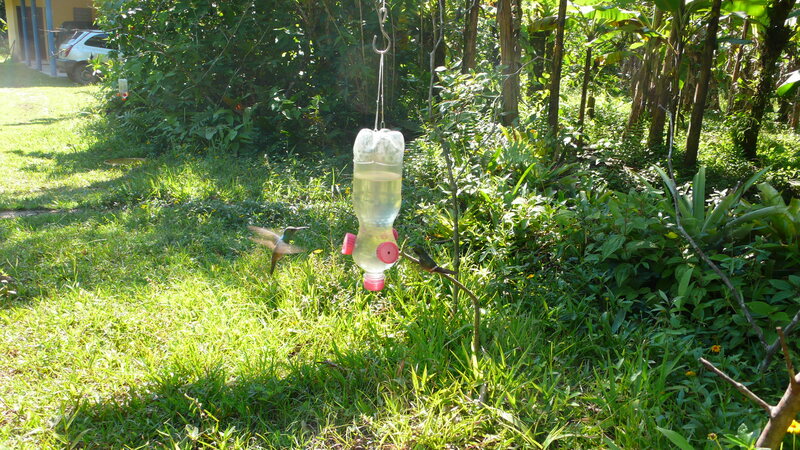 Back in November 2013, during my research and teaching trip to Brazil, I discussed an amazing garden that we visited in which the owner had set up around a dozen hummingbird feeders that were attracting hundreds of individual birds from over 20 species. As I mentioned, one of the owner’s concerns was that by feeding the birds he might be negatively affecting the reproduction of hummingbird-pollinated plants in the surrounding forest. I thought it unlikely but there have been very few tests of this idea, and none in that part of South America. After I left, a Master’s student called Jesper Sonne, based at the Center for Macroecology and Climate in Copenhagen, worked with my Brazilian and Danish colleagues on collecting data to address this question. 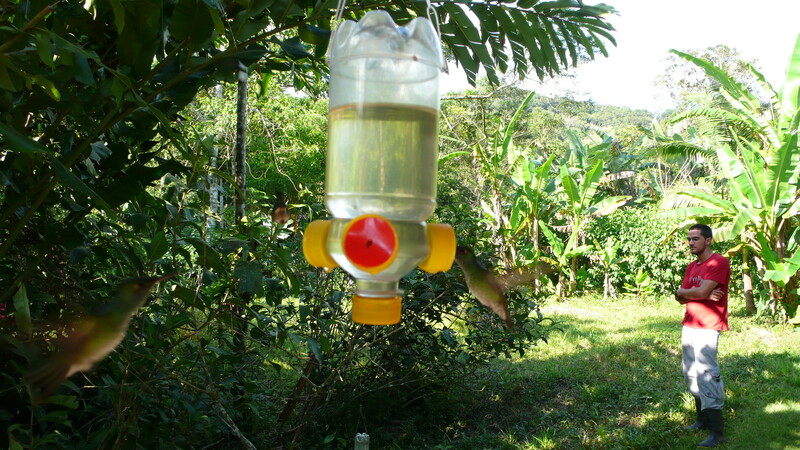 Between us we analysed and wrote up the results, and have recently published the paper in the Journal of Ornithology under the title “Spatial effects of artificial feeders on hummingbird abundance, floral visitation and pollen deposition“. The abstract is below and if anyone wants a PDF, please drop me a line. But the take home message is that although these feeders have a significant local effect on hummingbird abundance, there’s no evidence that they affect plant reproduction in the vicinity. It’s nice when predictions prove correct….